Loaded Potato Rounds have all of the tastes you love in a loaded potato skin but without all of the time-consuming prep work. Great for snacking while watching football or as a side dish for dinner. It’s officially Fall here in Middle Georgia, well, for me it is. When I have to turn the heat on in the morning to take the chill off, then it’s Fall. Today’s high is going to be in the 50’s – big change from the 75 degrees we had yesterday! Meanwhile, in Indiana my best friend alerted me yesterday that it was snowing there – um, no. Just no. Thank you. I love the snow – as in love to watch it snow, see it on the ground, and take pictures of it but after that 5 minutes, it can melt away. I also enjoy baking and cooking more when the weather is cooler outside. Something about warming up the house with good smells coming from the oven in the cooler weather and not sweating because the oven heated the house up to match the temperature outside! Not to mention, watching football when it’s in the 90’s outside is just wrong to this northern girl (and yes, I didn’t care for snow up north either). I know, I know, you are shaking your head saying “you can watch football in any kind of weather” – well, yes you can but not me. One of the things we enjoy while watching football is have some munchies around and even have a crockpot of chili going to eat during halftime. Years ago my husband asked me to make loaded potato skins and I did but I hated the prep work to get to the end result so that one time was it. 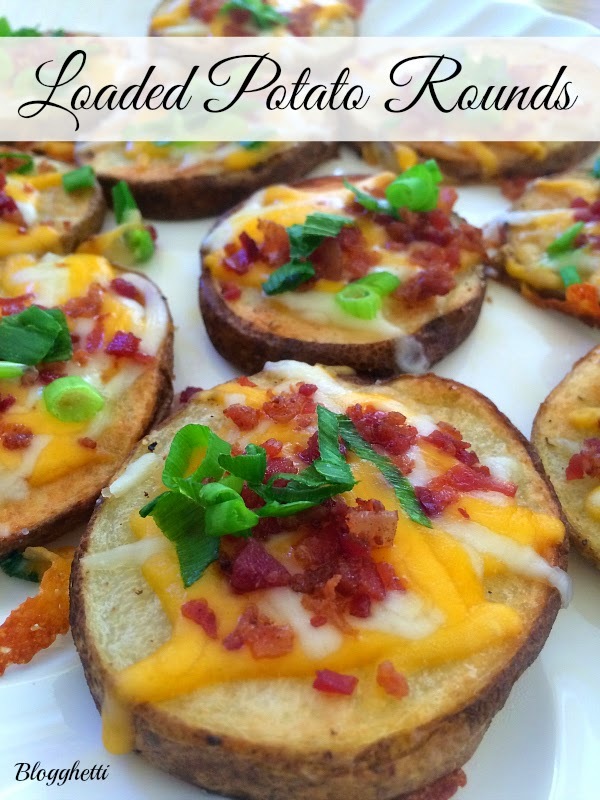 I decided to turn my roasted potato slices into these “Loaded Potato Rounds” and we all enjoy them so much more than the traditional “skins.” I am sure you will enjoy them as well. Pre-heat oven to 400 degrees. Spray a large baking sheet with non-stick cooking spray. Cut the ends of the potatoes off and discard. Cut the rest of the potatoes into ½ inch slices. Brush both sides pf the potato slices with the melted butter and sprinkle with salt and pepper. Place on baking sheet and bake for 30 to 40 minutes, or until lightly browned. Flip the potato rounds over about halfway through cooking time (15-20 minutes) to brown the other side. When potato rounds are done, top with cheese, bacon and green onions. Pop the baking sheet back into the oven for 3-5 minutes, or until the cheese is melted. Top with a small amount of sour cream, if desired. Serve immediately.